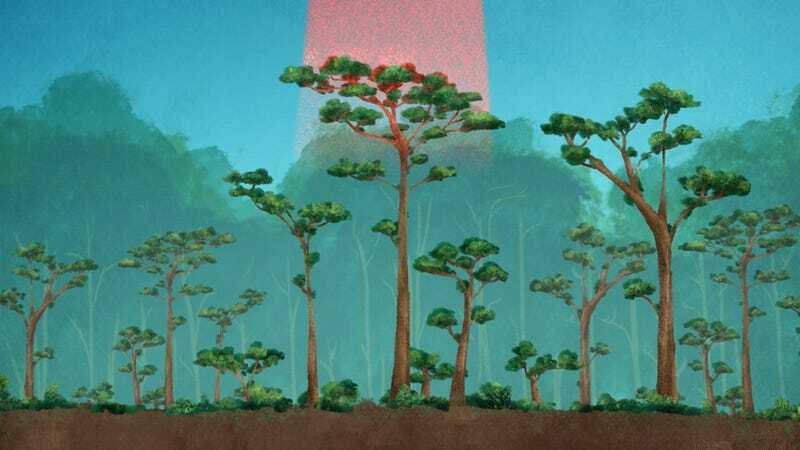 A laser pulse from NASA’s GEDI interacting with a forest canopy. The secret to stabilizing Earth’s climate could rest in the world’s forests. That’s why, this week, a team of researchers is sending a high-tech reconnaissance operative to the International Space Station to figure out how much carbon is stored in our planet’s trees. Tucked inside the next SpaceX Dragon spacecraft, and armed only with a laser altimeter, the Global Ecosystem Dynamics Investigation (GEDI) waits for deployment. Launching on December 4, this first-of-its-kind LIDAR instrument is designed to map the world’s forests in 3D, and by doing so give us better estimates of their biomass and how much carbon they store. Earth’s forests, like the oceans, soak up carbon from the atmosphere. But deforestation and other disturbances can cause that carbon to be released, and we still have a lot to learn about which forests are carbon sinks and which are carbon sources on a global scale. According to Ralph Dubayah, a professor of geographical sciences at the University of Maryland and the the principal investigator for GEDI, it’s going to be hard to predict future concentrations of CO2 in the atmosphere without that information. Not only do we need to better understand that carbon balance, we need to know how carbon is distributed spatially in forests. GEDI is going to help fill in these critical gaps in carbon accounting. It will do so by weighing trees. Which sounds like a complicated undertaking, but fortunately Dubayah and his team have armed GEDI with a powerful laser that can accurately do so without chopping any of them down. Essentially a scientific lego piece, once GEDI is removed from the Dragon’s trunk, it will be installed via robotic arm on the Japanese Experiment Module’s Exposed Facility. From its orbital perch, GEDI will provide the first high-resolution observations of the world’s forest vertical structure on a global scale. GEDI measures this vertical structure with the help of three lasers that will fire pulses 242 times a second at the Earth. It will then time how longs it takes some of that light to return to the instrument. One of the mission’s biggest challenges was simply having enough laser power and sensitivity to see through dense tropical forest canopies. As the laser pulses travel through the forest canopy, the reflections beamed back will be able to highlight the forest’s 3D structure much like an echocardiogram shows a doctor your blood vessels in your heart. “We can see and measure how tall the tree is and we can actually see how dense are the foliage and branches as we go down,” Bryan Blair, GEDI instrument scientist at NASA’s Goddard Space Flight Center in Greenbelt, Maryland, told Earther. Dubayah added that by the end of its planned two year mission, GEDI will have collected more than 10 billion measurements which will provide the most detailed map of the world’s forests. Trees are similar to people when it comes to height and weight. If you were to look at humans and make of graph of height versus weight, you’d see that taller people tend to weigh more than shorter people. It’s the same with trees. So if we know how tall trees are, we can convert their height into biomass numbers and get their weight. This way we will know how much carbon will be potentially released when we destroy them. Additionally, the height and vertical structure of trees can tell us about habitat quality and how changes in structures affect habitat quality and biodiversity. There are many reforestation projects underway around the world. But how effective are they in removing CO2 from the atmosphere? Where new trees are planted is just as important as how many. The data collected from GEDI will help policy makers understand the impacts of avoiding forest loss and degradation, and the benefits of reforestation projects. A few things are certain: when trees are cut down or burnt, CO2 goes into the atmosphere. GEDI will help illuminate how much carbon stands to be lost, enabling us to make more informed policy decisions when it comes to the environment. The question is, once that data is public, will leaders continue to deny the need to combat climate change? Amy is a science writer who really loves space.